June 26, 2013 – Hannah Williams is a 21-year-old gregarious single parent who works full time and is studying to become a nurse. Her daughter, Grace, has medical needs like any other 3-year-old kid. So when the cash-strapped Williams foots the bill for those needs, money gets tight. Williams, of Pittsburgh, is one of about 500,000 people in Pennsylvania who don’t qualify for Medicaid, but would if lawmakers decide to expand the medical assistance program by accepting federal funding. 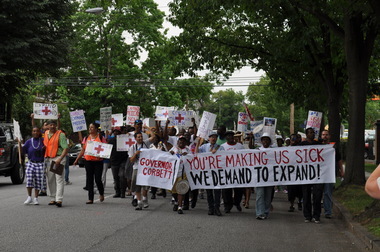 Medicaid expansion supporters march to the governor’s residence Wednesday to stage a "sick-in." The expansion, as proposed by the Affordable Care Act, would make all adults between the age of 19 and 64 who are at or below 133 percent of the federal poverty level eligible to receive Medicaid. Current estimates say 1 in 6 Pennsylvanians qualify for Medicaid – expansion would take that to about 1 in 4. The clock is ticking on the state budget deadline, so demonstrators Wednesday said they hoped to sway legislators and Gov. 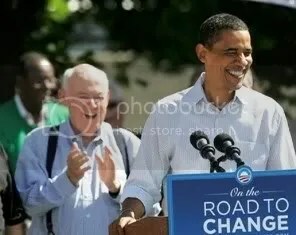 Tom Corbett in the direction of expansion. “Medicaid expansion will bring jobs and will help the working poor of Pennsylvania." – Cheryl JonesDeeming themselves, “the faces of Medicaid expansion,” at least 10 people will sleep overnight Wednesday in the Capitol building outside Senate Democratic leaders’ offices. Event participants said they chose to stick on the side of the Senate Democrats, as the entire caucus has supported expansion. The staging of the sleep-in was put together by several organizations including the Service Employees International Union and the Philadelphia Unemployment Project. Earlier Wednesday, dozens of demonstrators from those organizations staged a “sick-in” at the governor’s residence where they chanted and pretended to be sick. “Medicaid expansion will bring jobs and will help the working poor of Pennsylvania,” said Cheryl Jones, of Erie, who is one of those sticking it out for the night. While demonstrators were unrolling their sleeping bags and working on hanging signs, state Sen. Jim Ferlo, D- Allegheny, made an impromptu visit to the staging to tell the Medicaid expansion proponents they were in the wrong place, and should have been sleeping outside the offices of House Republicans. For now, Medicaid expansion remains an undecided portion of the budget as the Sunday deadline looms – along with liquor privatization, transportation funding and a plethora of other issues.